NEWS – AH Comics Inc.
MOONSHOT VOLUME 3 IS ON KICKSTARTER! 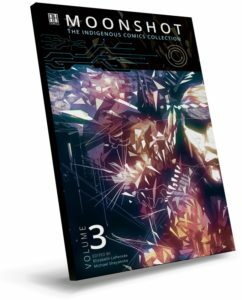 Two years in the making, the highly anticipated Volume 3 to the multiple award-winning Indigenous Comics Collection is here! Edited by Indigenous creators Dr. Elizabeth LaPensee and Michael Sheyahshe, this newest volume has an exciting theme and will be packed with 15 stories! With over 1,000 backers on Kickstarter so far, do not hesitate to click here to see the project page, read about the stories, the artwork, and choose to receive an advanced copy of hte book today! AH COMICS LAUNCHES MARK TWAIN’S NIAGARA IN NIAGARA FALLS! Come see us this weekend Friday, June 1st to Sunday, June 3rd at the Scotiabank Convention Centre in Niagara Falls where we will be launching the adventurous graphic novel adaptation of Mark Twain’s Niagara! We’ll be answering your questions and selling copies for the first time ever for this book, so visit Table 28 at the top of Artist’s Alley! You are also cordially invited to see some of the artists involved in the book, the author and screenwriter Zach Schwartz on Saturday at 4:00pm in Room 205 for AH Comics’ first ever hosted panel! Join us for an interactive, adventurous, mostly-true and somewhat exaggerated behind-the-scenes look at how AH Comics brought Mark Twain’s Niagara to life! Click the logo above for more information about the show, location and special celebrity/comic guests! AH COMICS IS BACK IN ACTION AT THIS YEAR’S FAN EXPO CANADA! From Friday, August 30th to Sunday, September 2nd visit our Premium A420 Table for table specials on our books, meet the creators of your favourite AH Comics publications, chat about our upcoming projects and yes, maybe share a laugh or two! SCI THE JEWISH COMICS ANTHOLOGY VOLUME 2 COMING THIS AUGUST! We are hard at work with the enthusiastic writers and artists, putting the finishing touches on the 18 stories that will be part of Volume 2 of SCI The Jewish Comics Anthology! There’s some amazing talent involved, including some of the biggest names in comic book history, so click here to see more information and artwork samples!